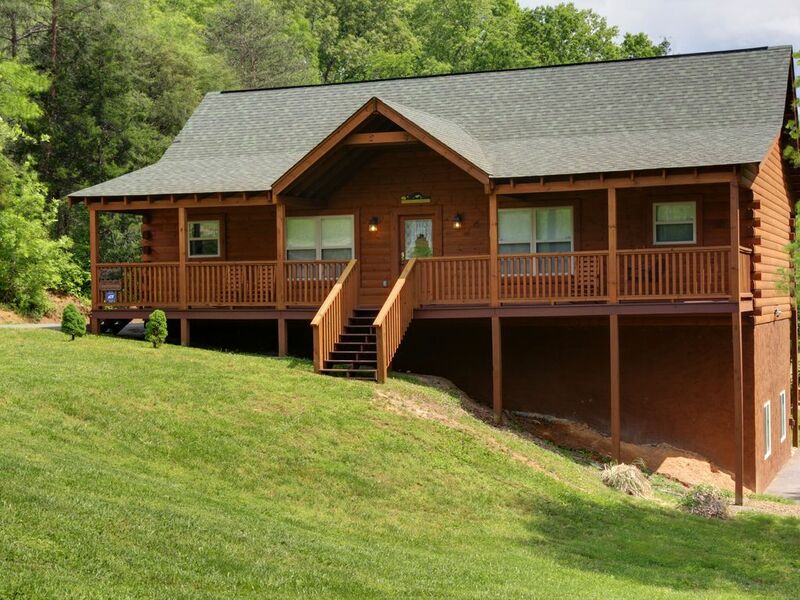 Deer Valley is a new cabin nestled in the wildlife where deer, red fox, and wild turkey are a common sight; an ideal place for a quiet getaway or family vacations & reunions. This home-away-from-home has Free Wifi and is situated on 1.22 acres providing ample room for outdoor activities such as camping, volleyball, or simply observing the wildlife. The cabin has two large bedrooms and two full bathrooms on the upper level (the Master bedroom has a King log bed and a large walk-in closet, the Guest bedroom has a Queen log bed and other log furniture). Both bedrooms are elegantly decorated and have a wonderful outside view of the surrounding property. There are also 2 large bedrooms, a game room and a full bathroom on the lower level. (each bedroom has a Queen log bed plus a full/twin log bunk-bed so they can sleep up to 5 in each room). There are four large sofa's (two in the Living room upstairs by the fireplace and two in front of the fireplace in the Game room downstairs). Plus there are 4 comfortable roll-away beds. The cabin is perfect for larger parties with plenty of room for the whole group. The living room is beautifully beamed with vaulted, tongue-and-groove ceilings. Furnished with rustic furniture, antler lighting, equipped with two large sofa's for those quaint evenings in front of the fireplace. There is also a round bar table with 4 chairs for family fun nights. Downstairs in the game room is a beautiful stacked stone fireplace, a standard pool table, television, two large sofa's, love seat, bar table, and numerous games for the entire family to enjoy; with an added full bathroom, stocked with linens and towels for your convenience. After a long day, you will enjoy winding down in the hot tub located on the back porch with Amish benches and a large table that seats 10 or resting in one of our many rockers on the front porch with a tall glass of lemonade and your favorite book. We live in Tampa and enjoy the wonderful change in atmosphere everytime we travel to the Smokies to stay in the cabin. We purchased the cabin after several trips to the area and meeting such wonderful people that give this vacation hot spot such a small town feel. The quiet evenings and awaking in the mornings to the sounds of numerous song birds just makes the cabin a peaceful place to unwind. We love being so close to all the activities yet not surrounded by the hustle & bustle of the city life. with ice maker and water in the door. Completely stocked with all pots, pans, utensils, dishes, glasses, crockpot, griddle, coffee pot, blender, toaster and electric skillet. Plenty of board games and such. 14 of us, parents, kids, spouses, grandkids, and an aunt for good measure. Room for everyone. Great location to bypass traffic and get to all the activity. Best part was just having everyone in one house again and enjoying our time together. This cabin is one of the best we had ever rented at Smoky Mountains and we had ben coming to TN every Spring Break with kids, it is perfect size and very clean. The back yard is one of the amazing think about this cabin! Perfect so kids can be outdoor all the time and play in the perfect environment!!! !+++++++ we will definitely come back and I highly recommend this cabin for large groups and families with kids! This cabin has everything you need for your stay! Lovely property with excellent kitchen appliances and ample plates, pans and flatware. We had an enjoyable family get together. Cabin was just the right size. We never could get the downstairs fireplace to work, but enjoyed the upstairs one a lot! Also, since we had young light sleepers downstairs and the smaller upstairs bedroom had a loud floor squeak/popping right over the downstairs bedrooms, we felt the room was off limits. The jacuzzi bathtub in the master bath didn't work, but the 2 little ones loved the deep tub all the same! The property is beautiful. As a youth group from a church we came in to stay for a weekend event and we spent our free time there at the cabin it was nice to have something to do and a place where we wanted to be. Loved the space to move and then to be outside in a field where students could run and be safe. The house was very easy to find, with lots of space for everyone. We brought some of our youth group for a weekend getaway and it was absolutely perfect. The house was spotless, beautifully decorated, perfectly laid out for a big or small group. The kitchen had everything we needed. The beds were VERY comfortable and there were even rollaways for those with big groups who need extra beds. The hot tub was a big hit and made the rain seem not so bad. It is located far enough from the hustle and bustle of Pigeon Forge, but close enough to easily get to all the attractions. We will definitely be staying here again. Thank you for sharing your home with us!!! Every thing was perfect the place is well maintained the decoration is beautiful the view of of the backyard over roll excellent. Dollywood & Splash Country are great day-long adventures and only 15 mins. away. The Gatlinburg ski resorts are only 30 mins. away along with the great shopping district in downtown Gatlinburg. Pigeon Forge has numerous shops and an Outlet Mall as well. The Forbidden Caverns are just 5 mins from the cabin and a must see for all our guests along with the Deer Farm which is within walking distance from the cabin. We have received so many comments that we are in the perfect place for peace & quiet at the cabin yet within minutes of all the activities in the Pigeon Forge / Gatlinburg area.